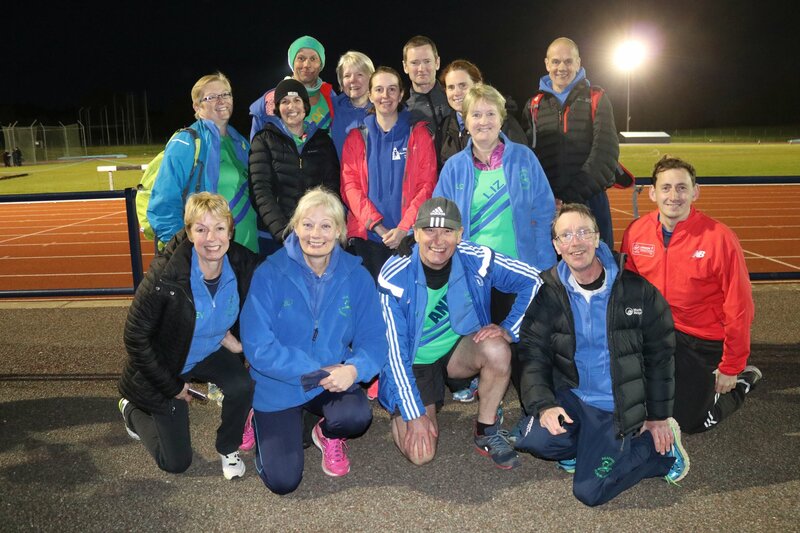 ‘On your marks, get set……..’ and with the gun shot echoing round Horspath Stadium, Oxford, on 30 April 2018, the Vet 35A men stormed down the 100m track, including Reading Roadrunner David Ferris, in an impressive opening event! David Fiddes and Nigel Hoult followed close on his heels, each giving a very strong performance in the Vet 50 100m and Vet 60 100m respectively. 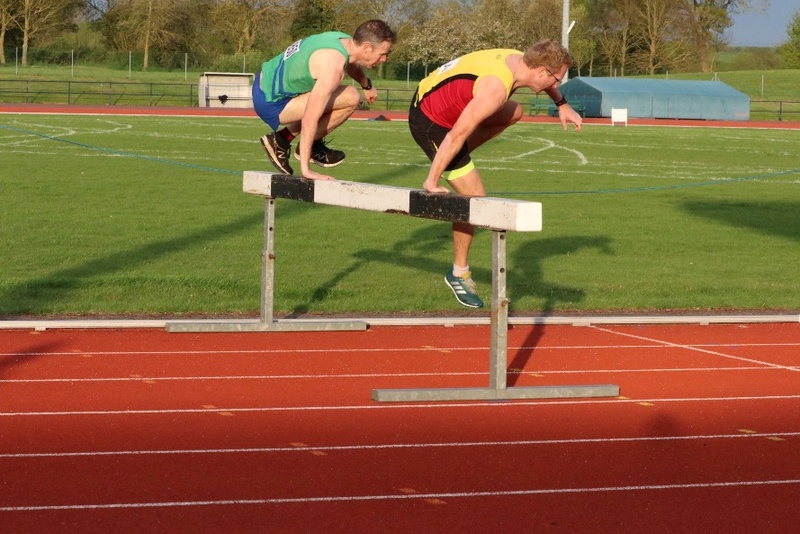 They did not stop there, David Fiddes also gave a sterling performance in the Vet 50 3000 steeplechase as did David Ferris, together with Ian Giggs, in the Vet 35 400m events. Simon Denton then beat Reading AC at their own game in the Vet 50 400m event! When talking about the events in which he participated, Nigel highlighted what many Roadrunners feel, i.e. sprinting is “something most of us don’t do in competition”. However, the atmosphere at the SCVAC Track & Field is fun and friendly. Indeed, Nigel recounted that there was “a bit of humour when the starting pistol didn’t go off for one of the races!” Furthermore, there is a sense of achievement in competing against clubs who focus more on athletics than road-running. Nigel was rightly pleased which his 100m time of 17.8 seconds, and that he scored 4 points for the club. Furthermore, although Nigel had little time to prepare for his 400m race, because he had been co-ordinating our team and watching the steeplechase, his time was nevertheless impressive! When it came to the 1500m events, Reading Roadrunners certainly came into their own. Ian Giggs was a strong contender and Mark Worringham and Pete Jewell were second in the Vet 35 and Vet 50 age categories respectively. Fergal Donnelly flew round the track in just 5 minutes flat! As a non-scorer, he ran with the Vet 50 runners and said modestly afterwards, “I learned how to finally win a race – run in an older age category!” However, I am sure Fergal would have given our competitors in the younger age category a run for their money! Like Sam, I was really pleased with my 100m and 400m achievements too, especially since this was my first ever track & field event, but I agree with her that the team spirit of the Reading Roadrunners and our competitors (shown in the individual and relay races) makes these events even more enjoyable! I would like to thank Sam and Roger Pritchard for encouraging me to take part, Tony Canning for the coaching for the sprint events and for his patience (I did not even have the spikes screwed into my sprinting shoes when I first started training!) and Glynne Jones for his advice. With their support and that of Nigel and our team, I had the courage to take part and enjoyed it! 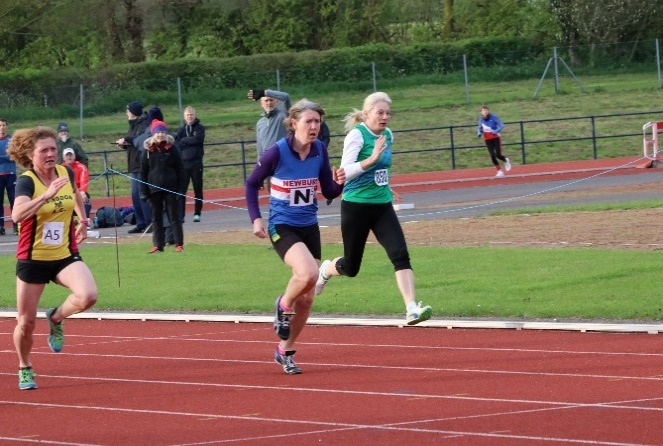 Adele Graham was just half a second behind her Reading AC competitor in the Vet 50 100m race and Tracey Lasan finished ahead of her Reading AC competitor in the Vet 60 100m and ahead of Oxford in the Vet 50 400m race! Helen Pool and Claire Seymour did us proud in the Vet 35 1500m race too. The Reading Roadrunners have talent, even when not roadrunning! “Not since 1966 had I tried to put the shot. Some of the other competitors seemed to be capable of throwing (not the right word as you will see) the shot a remarkably long way! I stepped up in the ring, after sagging under the weight of the shot, and took Glynne’s advice not to stand back, twirl or stagger. I grunted and hefted and the shot hit the sand at what appeared to be not far beyond my toes, but actually was 5 metres in! “No put!” was the referee’s response. Apparently, I had let the shot part from my cheek on launch and had effectively “thrown” it, which is not allowed. On the second round I did the same – about 5 metres in, but a “no put”. There were audible sighs of relief, when it was deemed on the third round that the put was good and the 5 or so metres stood. Andy recommends that these events are something worth trying and can be done by anyone with minimal training. He feels it does require some practice to gain technique, but strength and balance rather than speed are key to success. A discipline different from just running and well worth a go! Adele Graham took third position in the Vet 50 Hammer event for the ladies and represented us in the Vet 50 long-jump too and javelin events too! 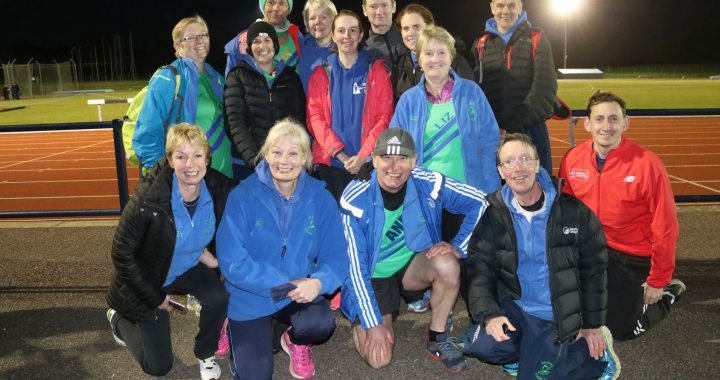 Helen Grieves and Liz Atkinson, following her superb performance in the London Marathon, also scored well earned points for the Reading Roadrunner ladies in the Vet 35 and Vet 60 Javelin events! The SCVAC Track & Field League Starts has certainly started with a bang! The Reading Roadrunners team would be top of the leader board, if points were also scored for team spirit and we went home with something as important as any award, a great sense of achievement! On behalf of us all, a big thank you to Nigel Hoult for organising the Reading Roadrunner team, to Tony Canning and Glynne Jones for the coaching sessions provided for these events and to Sam Whalley and all those involved. Fergal Donnelly spoke for us all when he said it was “a great evening, expertly organised by Nigel & team”. The next fixtures are on 14 May, 4 June and 2 July 2018. Nigel Hoult has published the details. Come and join us!